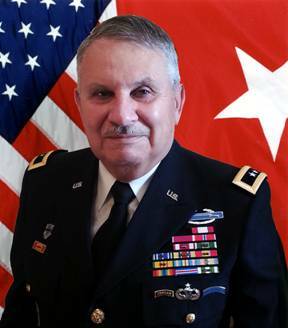 Major General Douglas O. Dollar grew up in the Cookson Hills of rural Eastern Oklahoma, where he learned to enjoy hunting, fishing and camping in the great outdoors. He was commissioned in the U.S. Army Infantry in 1968 as a Distinguished Military Graduate through the ROTC program at Oklahoma State University, and served as a rifle platoon leader in Vietnam, and later as training officer of the 5th Special Forces Group at Ft. Bragg, NC. Like many veterans of that conflict, he reluctantly decided that perhaps military service was not for him, and left active duty. But ultimately recognizing the rewards of association with other soldiers, he entered the Army Reserves when he joined the 95th Division (Training) and served in such key assignments as Battalion Commander, Division G3, Brigade Commander, Division Chief of Staff, and Assistant then Acting Division Commander. He became Commander of the 80th Division (Institutional Training), headquartered in Richmond, Virginia, in 2001. Dollar always felt that he and his fellow rifle company infantrymen in Vietnam had not been trained adequately for the complexities of a counter-insurgency conflict, and thus suffered needless casualties. His reentry into the U.S. Army consequently focused on training soldiers for combat and leadership. He is proud to have been a small part in the U.S. military’s transition to a professional force, and the introduction of innovative training practices. Throughout his career, he has worked to mentor and recognize junior soldiers and has led through such groups as the Reserve Officers Association and the 95th Division Foundation (http://www.army.mil/article/124202/WWII_vets_rededicate_95th_Training_Division_memorial_at_Fort_Sill/). For more than twenty years, he has worked to preserve the 100+-year-old Military Honor Society, Scabbard and Blade (http://www.scabbardandblade.org), and transformed it for developing future military officers in a new century. He also was the initiator and leader in its early years of the Oklahoma Military Hall of Fame, an effort to help educate the public about the notable military service of the state’s and nation’s men and women (http://www.okmhf.org). As a result, the Hall of Fame now presents the Major General Douglas O. Dollar Distinguished Service Award to deserving individuals for their service to veterans — for supporting community activities that strengthen the quality of life for members of that community, and for citizenship setting the example for other citizens bringing credit to the uniform services. In 1981, Dollar established New Forums Press, a venue for scholarly works devoted to professional development in higher education (http://www.newforums.com). Before long, he began publication of various titles related to military service. With the planned publication in 2015 of They Were Families: How War Comes Home(http://newforums.com/respite-positive-proactive-recipes-partners-wounded-warriors/), a call for action concerning the struggles of veterans and their families afflicted with Post Traumatic Stress Disorder, he pursues what he sees as his responsibility, as a former military leader, to support the nation’s servicemembers and veterans throughout life. General Dollar is a Tahlequah, OK, High School and an Oklahoma State University graduate with a bachelor’s degree (Advertising), master’s degree (Mass Communications), and a doctor of education degree (Higher Education Administration). He resides in Stillwater, OK, with his wife Gayla. They have one son, Rodney, and two daughters, Karen and Katherine.